← This girl has got goals. And a snoring husband. I seriously love roasted vegetables. They are so easy, and take a meal from meh- to really delicious and satisfying. I *especially* love roasted cauliflower and yams or sweet potatoes. 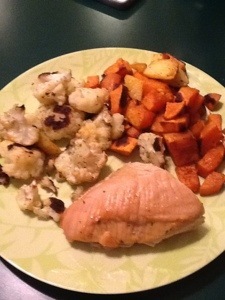 So, tonight for dinner, I made a turkey breast, and some roasted cauliflower and yams, and a few yukon golds we had leftover. On the cauliflower I put salt, pepper, olive oil and dill. On the yams, chili powder, cumin, paprika, salt, pepper, and olive oil. On the yukon golds, salt, pepper, olive oil, and a little bit of garlic salt. I roasted them at 400 degrees for about 35 minutes. Near the end of the time, the last 7 or so minutes, I kept decreasing the temperature by about 5 degrees every two or so minutes. I have so much grading that I could do tonight, but I am on the fence as to whether I will actually do it. Hmmph. *I burnt the roof of my mouth last night at dinner, so today, every thing I eat is excruciatingly painful. *This morning I picked up my heated up curling iron by the barrel end. *I finally called my insurance company back after they called me three times last week to enroll in a free program for women, but when I called I realized it was for pregnant women. Womp. Womp. Womp. I had to tell him I had a miscarriage. I was actually ok, but I felt really bad for the man I talked to on the phone. He was really sympathetic, and kind. He assured me that they wouldn’t call me back about that. And actually, directed me toward prenatal program that I could enroll in that was also free. As I am still in a place of hope, this was a small trip up in the course of my day. However, if it had been 6 months down the line and we are still not pregnant, it might have been a major setback. But, it wasn’t. And I am ok. I am hopeful. *I took a nap after school. I need to stop doing that. *I feel organized this week. This is good. I made a meal plan!!! YAY!!!! Well, that’s all I got. I am off to read blogs in my google reader, and catch up on gossip and healthy people running and eating pumpkin. This entry was posted in Uncategorized and tagged cauliflower, dill, goals, google reader, gossip, grading, insurance, kind, meal plan, miscarriage, nap, olive oil, organized, pepper, pregnant, roasted vegetables, salt, school, toaster oven, turkey breast, yams, yukon gold. Bookmark the permalink.